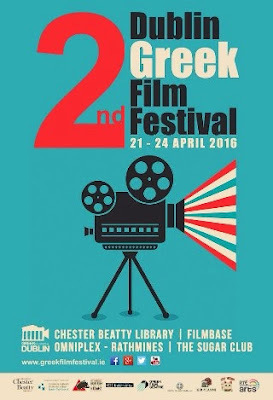 The Second Dublin Greek Film Festival runs next week [21 to 24 April 2016] and closes with a fundraiser for refugees in Greece from 4 p.m. to 9 p.m. on Sunday 24 April 2016 in the Sugar Club. The festival presents features, documentaries and short films along with special events in top cultural venues in Dublin. The aim of the Festival is to promote Greek culture through a variety of films and events and show links between Ireland and Greece. The Festival will showcase the latest films by both internationally established directors and emerging filmmakers, who are currently producing many of the most dynamic, innovative and provocative films in the world. The Sunday fundraiser on Sunday 24 April includes a showing of the documentary A Family Affair and a concert by Pakaw! This movie is an intimate portrait of the famous Xylouris family and their sacred bonds with the musical tradition of Crete. It follows three generations of musicians of the family who uphold and pass on the vibrant tradition of Cretan music, performing ceaselessly to followers across the world. From the legendary Antonis Xylouris – widely known as Psarantonis – to his son, the famous lute player and singer George Xylouris – nicknamed Psarogiorgis – and his three children Nikos, Antonis and Apollonia studying in Australia, the film follows Greece’s most famous musical clan to discover the electrifying power of their music and the sacred ties that hold the family together. Pakaw! is the all-female combo based in Britain that pushes the boundaries of the traditional. With Greek music at its core, these five tangy, opinionated, international women excite with their sultry vocals and versatile musicianship. Tickets for the fundraiser for refugees in Greece are €10 and €15. I booked my tickets for the fundraiser and double event (A Family Affair documentary and the concert by Pakaw!) at the venue’s link.